AIR CTI is an Australian company that specializes in central tire inflation (CTI). The company makes devices that allow a driver to adjust tire pressure depending on the weight of a load and road conditions. The air pressure can be adjusted through a controller mounted on a truck’s dashboard, which commands an inflating and self-draining filter assembler. If a nail punctures a tire, for example, the driver can inflate that particular tire from his or her seat without stopping the vehicle. Cline and his fiancée, Wendy Jolley, delivered a presentation at American Trucking Associations’ 2019 Technology & Maintenance Council’s annual meeting March 17. TMC develops recommendations for fleets regarding equipment maintenance. The group also conducts surveys for members of the industry and facilitates cooperation among designers, manufacturers and transportation companies. Cline, a diesel mechanic and welder by trade, said AIR CTI systems are especially useful for drivers operating in remote areas such as the Australian Outback because the technology allows them to continue moving instead of stopping to make time-consuming and costly repairs. “We’re way away from civilization most of the time, so we can’t just ring up and say ‘Hey can you fix this?’ ” Cline said. Cline explained that tires fare better and last longer when their air pressure is adjusted to suit the conditions they are operating in. For example, a steep drive up a long hill would be best handled by trucks with tires that have been pumped up to minimize resistance. In order to demonstrate his technology to a driver, Cline tested AIR CTI on a truck that was stuck in mud in western Australia, which is home to rugged terrain and vast deserts. He lowered the air pressure in the tires of the mired truck, deflating them so that they sagged slightly and created a larger footprint. Acting like a snowshoe, the slightly deflated tires found purchase on the saturated ground and the truck advanced out of the mud. Besides improving the lifespan of tires, adjustable air pressure devices can reduce damage to infrastructure, according to Cline. Tire pressure also can impact drivers’ physical well-being. Cline said that proper tire pressure results in a smoother ride for a trucker, which can prevent lower back pain. 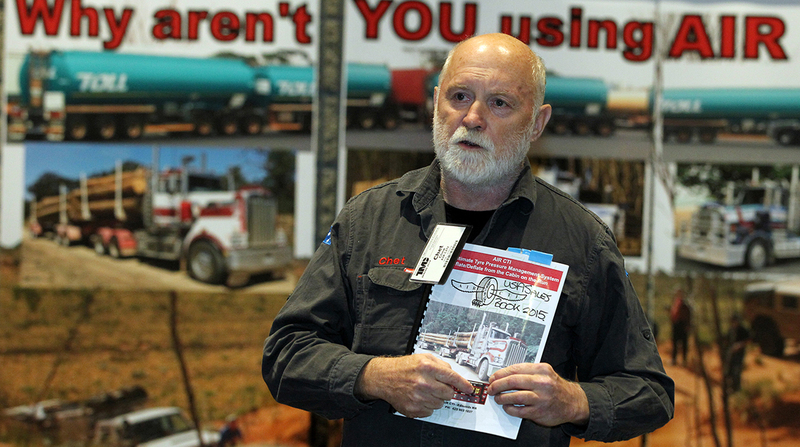 Cline estimated that his systems equip about 10,000 trucks in Australia, but he expressed interest in expanding his market further in the United States and Canada.